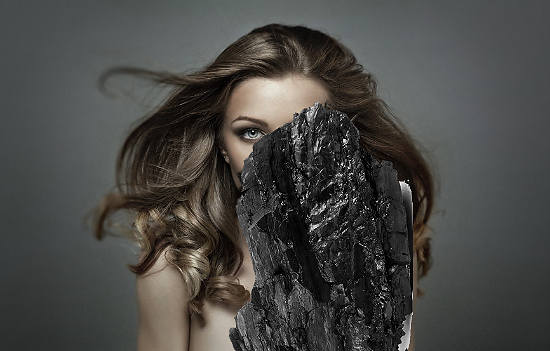 Today, we’ll learn how to turn a portion of skin into rock/coal in less than 10 steps using adjustment layers, the “Blend If” function and layer mask. This is a very versatile effect that can be used in a number of ways – for book covers or art projects – to create a mysterious, gothic-like feel. So don’t be afraid to experiment! I’ll be using Photoshop CS6 and a PC in this tutorial. First, we’re going to prepare the image. Create a “Curves” adjustive layer – refer to the bottom of your layer panel and click on the half-filled circle icon. Select “curves”. Now, drag the bottom left of the white curve to the right, just like what you see below. Using a large soft brush, paint black on the Layer Mask of the Curves adjustment layer over the model’s face. This will ensure that the face will not be affected by the Curves adjustment layer, but everything else will be. Make sure it’s a very soft fade. 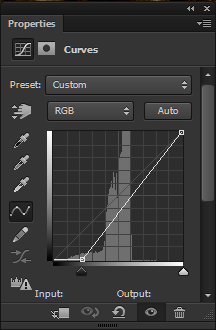 Next, create a new layer above your Curves adjustment layer and name it “Noise”. Fill the layer with black, and set its layer mode to “Screen”. Go to Filter > Noise > Add Noise and set the amount to around 5%, the Distribution to “Uniform”, and make sure “Monochromatic” is checked. Doing this adds a slight amount of texture to your image, and also reduces banding. It’s a very handy trick to learn, and can be applied to any image that you’d like to have a little texture on! Now, let’s add a dark fade around the edges. Create a new layer and name it “Fade”, set the layer mode to “Overlay” and the opacity to around 40%. Select the Brush tool and and make it very large and soft, and paint black around the corners of the image. Some people like to use the gradient tool for this, but I prefer doing it by hand. If you find that the edge is too harsh, go to Filter > Blur > Gaussian Blur and blur it out more so that it’ll blend better. Finally, we’re going to create a Hue/Saturation adjustment layer and bring down the Saturation to -36. Now, we’re going to create the base of our coal and determine where we want the models skin to be coal. We’re going to create 3 different adjustment layers. The first is a Brightness/Contrast adjustment layer set to -150 Brightness and 100 Contrast. Fill the layer mask with black, and then with a white, grungy brush paint where you want the skin to be coal. Next, create a second Brightness/Contrast adjustment layer above the one you’ve just created. Set the Contrast to 80. Now, go back to the first Brightness/Contrast adjustment layer and click on its layer mask. Hold down the Alt key and drag the layer mask onto the second Brightness/Contrast adjustment layer to copy the layer mask onto it. If your image is already dark or highly contrasted, you can skip this step. Create the third layer, the Vibrance adjustment layer and set the Saturation to -100. Again, copy the layer mask from the previous adjustment layer onto the Vibrance adjustment layer’s layer mask. Keep in mind that you can use any color here, not just black, by using the Hue/Saturation adjustment layer. It’s a good technique to produce a face paint-like effect. Now just as you did before, copy the layer mask from your previous adjustment layers to the coal image. With a soft round brush set to black, paint on the layer mask of the coal image and mask out the bridge of the nose, and the lips. Make sure everything blends nicely. To create a group, just go to the bottom of your layer panel and hit the folder icon. Place the three adjustment layers you’ve created, plus the coal image into the group, keeping the original order. 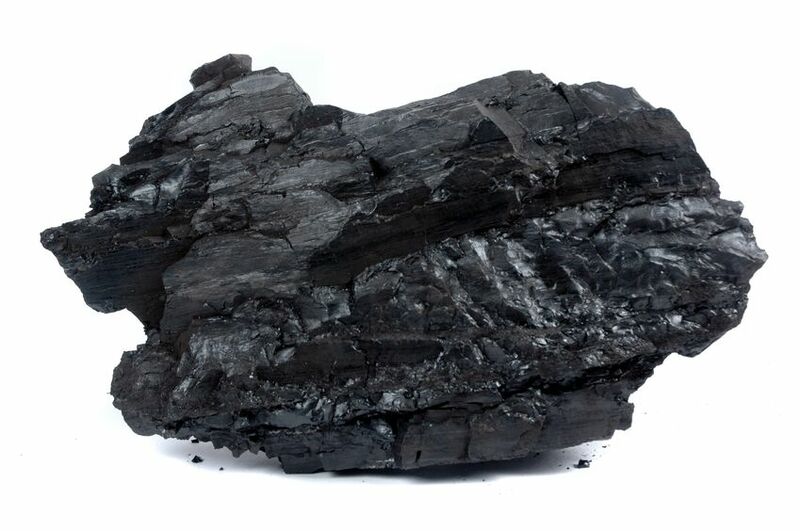 Name this group “Coal”. Hit the arrow on the left side of the group to open/close the group. Create a new layer under your “Coal Folder”, name the layer “Coal Shadow”, and set the layer mode to “Overlay”. Select a soft round somewhat small brush, bring the Opacity of the brush down to around 20-30% and set the color to black. We’re going to paint black around the edges of the coal to add depth. You want it to blend well, and be very subtle. Now, increase the brush size to a sizable amount and paint white on the outside of the area you’ve just painted black. If the black is too dark, you can always bring down the opacity of your layer. 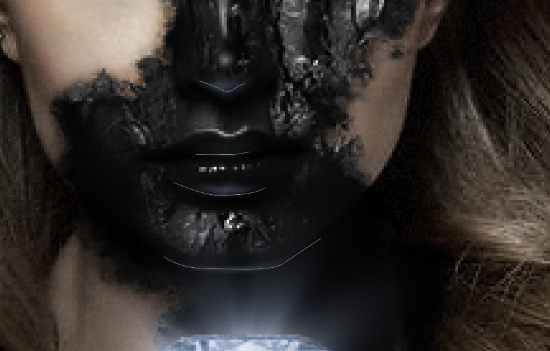 We want this to be very subtle, just so that the coal looks like it’s connected to the skin. Now we’re going to create the diamond. Grab an image of a fairly large diamond and cut it out. The diamond I’m using is freely available and already cut out. Position and resize the diamond in the center of the chest. 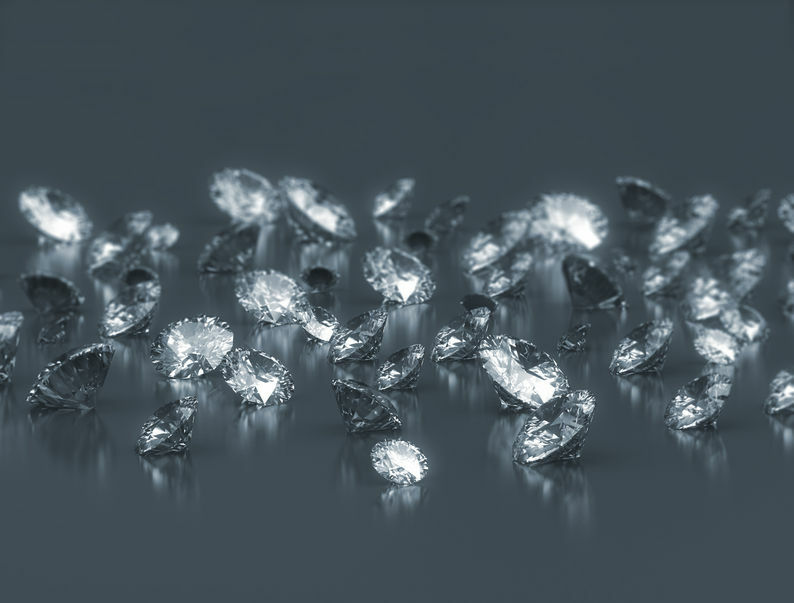 Darken the diamond by going to Image > Adjustments > Brightness/Contrast and bringing the Brightness down to around -35. 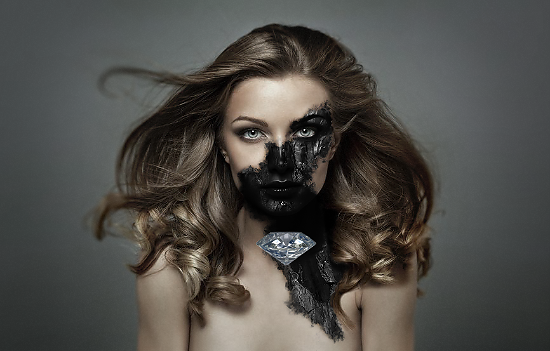 Adding bits of coal onto the diamond will help to tie it in with the rest of the image. To do this, go into your “Coal” group, and copy the piece of coal image that you’ve used on the face. Delete its layer mask, and right click > Clear Layer Style. Drag the copied coal image above your diamond layer, then resize and adjust it over your diamond. 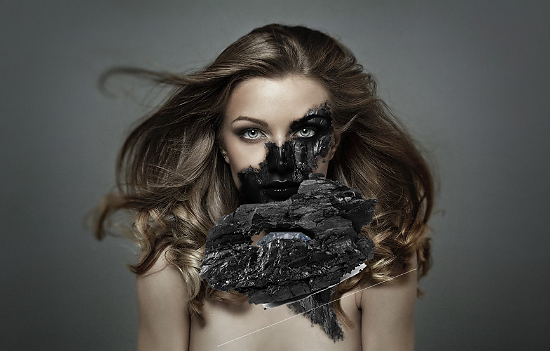 Add a layer mask to your coal image and fill it with black. Start masking out pieces of the coal using a hard round white brush. To add the shine to the diamond, you’ll first need to create a new layer below your diamond layer. Set it to “Screen”, and around 65% opacity. Either using a “light burst” brush, or a soft round brush, paint streams of light coming from the diamond. Make them very soft. 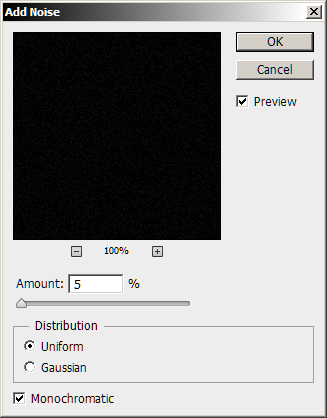 If you use a “Light Burst” brush, then make sure to blur it by going to Filter > Blur Gaussian Blur. Next, create a new layer above your coal and diamond layers. Set it to “Overlay”. Again, paint a light burst effect using a light pale blue color. This time, we want the beams to be a little less soft. Create yet another layer and set it to “Screen”. Select a soft round brush, and paint a light pale blue onto the diamond in medium sized blots. Make it look as if the diamond is glowing underneath the coal. Now, we’re going to add the glow. 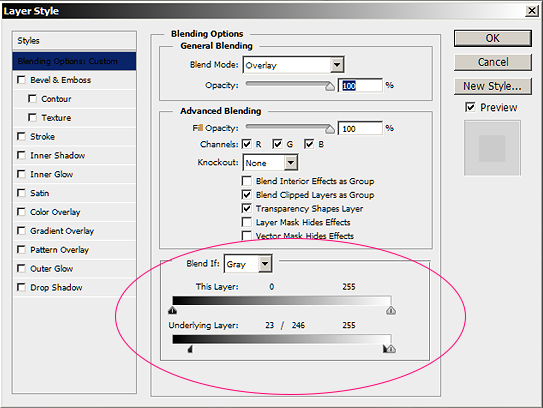 First, create a new layer above the last layer you made and set it to “Screen”. Using the Eyedropper tool, grab a very light color from the diamond, most likely a very light pale blue. We’re going to add a glow to the edge of the lips, and the bottom of the nose and chin. Go to your Brush tool and set it to soft round and very small. For me, it was 3px. The larger the image, the larger your brush will be. Now, select the Pen tool and create a path on the bottom of the chin, nose, and the edge of the lips – it doesn’t have to be perfect. Right click > Stroke Path and make sure Simulate Pend Pressure is checked. Click OK. If the lines are too harsh, use the Smudge tool to smudge them out and blend them. Create another layer and set it to “Overlay”. Using a medium light blue and a large soft round brush, paint blue on the lower face, diamond and hair. I also painted this blue into the eyes to give her blue eyes. Create another layer above the last layer and set it to “Overlay” again. With the same blue as before, paint more blue onto the hair and the cheeks. Double click on the layer to open up the Layer Style panel. 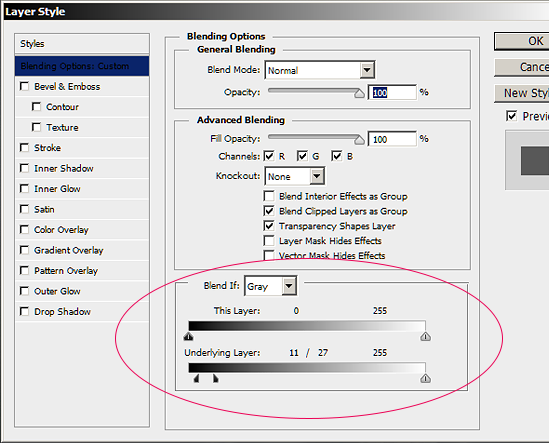 Set the “Blend If” settings to what you see below. 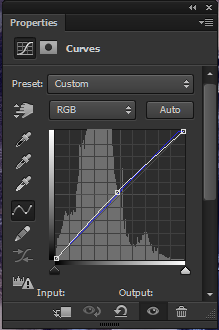 To complete this image, create a Curves adjustment layer and go to the “Blue” channel by clicking on the RGB drop down menu and going to “Blue”. Bring up the blue curve on the far left. 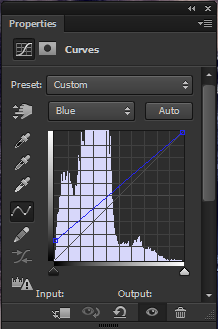 Lastly, create a second Curves adjustment layer and bring up the white curve in the middle.